Dearden, R. 2016. 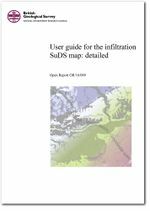 User guide for the infiltration SuDS map: detailed. British Geological Survey Internal Report, OR/16/009. This page was last modified on 8 July 2016, at 14:40.